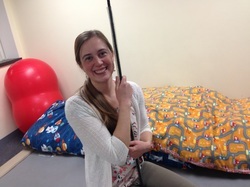 Brooke Belmont, MS, OTR/L has been a registered and licensed occupational therapist since she graduated with her Master’s degree from University of New England in 2018. Brooke became part of the Peer Projects – Therapy from the Heart team in October 2018 after having the pleasure of completing her last fieldwork rotation here in 2017. Brooke has pediatric experience in a variety of pediatric settings including the school setting and outpatient clinics. Brooke values working closely with families and utilizing play to address client centered meaningful goals. Brooke loves spending time with her family and friends and being outdoors, especially on the beach! She is very excited to be a part of the PPTFTH team and is looking forward to meeting you! ​Meara Bransfield, MS, OTR/L has been a registered and licensed occupational therapist since she graduated with her Master’s degree from Quinnipiac University in January of 2013. Meara has worked in a variety of pediatric settings including outpatient clinics and the school setting. She recently joined the Peer Projects-Therapy from the Heart team in June 2016. She is passionate about working together with families and clients and loves seeing children progress and grow through the use of meaningful therapeutic activities. In her free time Meara enjoys staying active by running, and spending time with friends and family, especially her three adorable nieces. ​​John Chambers, MS, OTR/L has been a registered and licensed occupational therapist since he graduated with his Master’s degree from American International College in August of 2015. John has previous experience working in the school system setting where he learned his passion for helping children. He recently joined the Peer Projects-Therapy from the Heart team in June 2017. He enjoys incorporating families as much as possible and seeing children progress through therapeutic intervention. In his free time John enjoys staying active by participating in a number of organized sporting activities such as baseball, football, golf and often attends a local fitness center. John also enjoys superheroes and Disney; so don’t be afraid to ask who his favorites are. Elizabeth Cross, MS, OTR/L joined Peer Projects – Therapy from the Heart in August 2017. Elizabeth completed her graduate studies in Occupational Therapy at Boston University in January 2017. She has experience working with children and adolescents in a variety of settings, including roles in pediatric outpatient rehabilitation, community-based life-skills, self-advocacy training, social skill development, and behavior regulation programs. She values family-centered care and utilizing multi-sensory play to address goals that are occupation-based and meaningful to the children with whom she works. Elizabeth loves dancing and singing along to Broadway show-tunes, exploring the great outdoors, and performing improvisational comedy. She is thrilled to be part of the PPTFTH team and looks forward to meeting you! ​​Beth Dahlmer, OTR/L has been a Registered and Licensed Occupational Therapist specializing in pediatrics for over 25 years. In 1987 she received her Bachelor of Science in Occupational Therapy from the University of New Hampshire. Beth is certified in the Sensory Integration and Praxis Tests (SIPT). Beth began her career in a hospital setting working with outpatient clients from birth to twenty years old. She has also worked in a variety of other settings including private practice, early childhood intervention, and schools. Beth is passionate about helping clients and their families. She values the role of play and identifies with the following quote: “You can discover more about a person in an hour of play than in a year of conversation.” – Plato (Greek philosopher 427–347 BC). 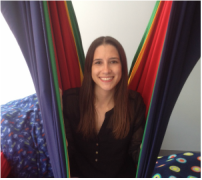 Beth began working at Peer Projects - Therapy from the Heart in 2013 and we are thrilled to have her as part of our team! ​﻿﻿Bryna Hart﻿﻿﻿﻿﻿, COTA/L has had training in multiple pediatric settings including public schools, special educational programs, and outpatient sensory clinics. Bryna graduated from North Shore Community College with an Associate degree in health sciences as an Occupational Therapy Assistant in the spring of 2014. Bryna also obtained an Associate degree in Science with a focus on Business Administration in 2011. During her educational career, Br﻿﻿yna was a child care provider for multiple families on the North Shore. She is extremely passionate about working with clients and their families to increase their overall health and well-being, their independence across all areas of life, and towards obtaining individualized goals. Bryna has been working at Peer Projects - Therapy from the Heart since September, 2014. She specializes in individual and small group therapy﻿﻿﻿﻿﻿, and is also a co-group leader for larger peer groups. Bryna is Handwriting without Tears Certified for K-5 school aged children. In addition, you’ll sometimes see Bryna lending a hand to work on administrative tasks in the clinic. Deborah Jaskey, MS, OTR/L joined Peer Projects – Therapy from the Heart in January 2015. Her educational training includes a BS in Therapeutic Recreation with a minor in Early Intervention from Clemson University. Following her undergraduate degree, Deborah worked for 7 years in early intervention which sparked her interest to become a Pediatric Occupational Therapist. She chose to do her Master’s thesis at Sage Graduate School on the Family Centered Approach in Early Intervention, and the importance of parent follow through. Deb has experience in multiple settings, including schools, home care and healthcare facilities. She has worked with children on the autism spectrum, collaborating with ABA specialists, and enjoys each child's energy and uniqueness. In addition to traditional OT modalities, Deb employs her knowledge of sensory integration techniques in her daily work. We are so glad that she chose to relocate to Danvers, after living in SC and VT. Just like many of her kids, Deb likes to stay active and outdoors, kayaking, hiking and chasing her dog, Indigo. Diane Levinson, MS, OTR/L has been a practicing pediatric occupational therapist for over 30 years. She has worked in school systems, hospitals, clinics and private practice. She established the first occupational therapy department within the Brockton Public Schools, worked at Youville Hospital in Cambridge with Dr. Margaret Bauman and the Pediatric Team that evolved into the LADDERS Program and co-founded Project CHILLD, an occupational therapy clinic specializing in integrating occupational therapy treatment with the field of sound training. Diane presently works at the Marblehead Charter School, at OTA the Koomar Center and at Peer Projects ~ Therapy from the Heart as a staff therapist and listening consultant. ​Michelle Rust, BA, COTA/L joined the Peer Projects - Therapy from the Heart team during the summer of 2014. Previously, she earned an undergraduate degree in Psychology from the University of Delaware. Then, while working in administrative positions in outpatient pediatric OT clinics, Michelle watched miracles happen through the power of therapeutic relationships, music, and play, inspiring her to study Occupational Therapy. She also has experience as a nanny, is a weighted blanket maker, avid bicyclist, synchronized swimmer, and yogini. Michelle completed a clinical affiliation studying Ayurveda, yoga, and alternative nutrition. She has received formal training in Handwriting without Tears, is a Reiki Level II practitioner, has completed training in Mindfulness Fundamentals, and earned a certificate in Mindful Educator Essentials - introducing mindfulness into educational systems and institutions. You can also find her helping out in the office, assisting in group sessions, and creating customized weighted blankets! Lisa Swain, COTA/L ​has been a certified occupational therapy assistant for 18 years. After graduating North Shore Community College in 2000, she has worked in a variety of settings including school systems, outpatient therapy, home care and skilled nursing facilities. Currently, Lisa sits on the board at North Shore Community College Advisory Board helping shape the curriculum of OTA students. She also serves as a clinical field work supervisor mentoring 3 students a year. Lisa enjoys watching children grow through purposeful play as well as working with families to achieve their goals. In her free time she enjoys spending time with her family of 3 children and a grandson, crafting, going to the beach and reading. and effective occupational therapy services.